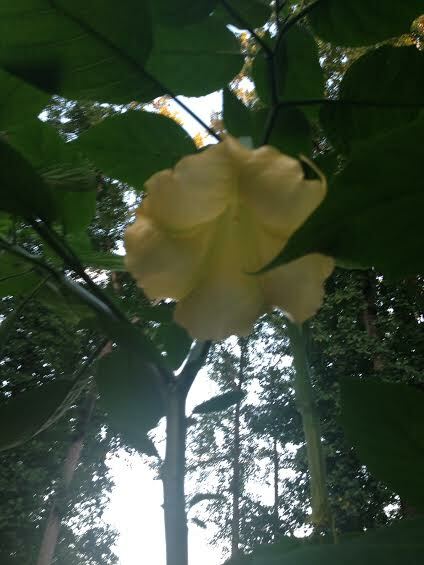 This entry was posted in Flowers / Flowering plants and tagged Angel Trumpet, Yellow Brugmansia. Bookmark the permalink. Here people put these trees in their garden and they grow large and are full of flowers that last weeks. Each individual flower may be short lived but they keep on blooming. I think it’s a bit like hibiscus where each flower lasts only a single day but the tree is covered in flowers because it just keeps budding. Maybe your climate isn’t very good for it? 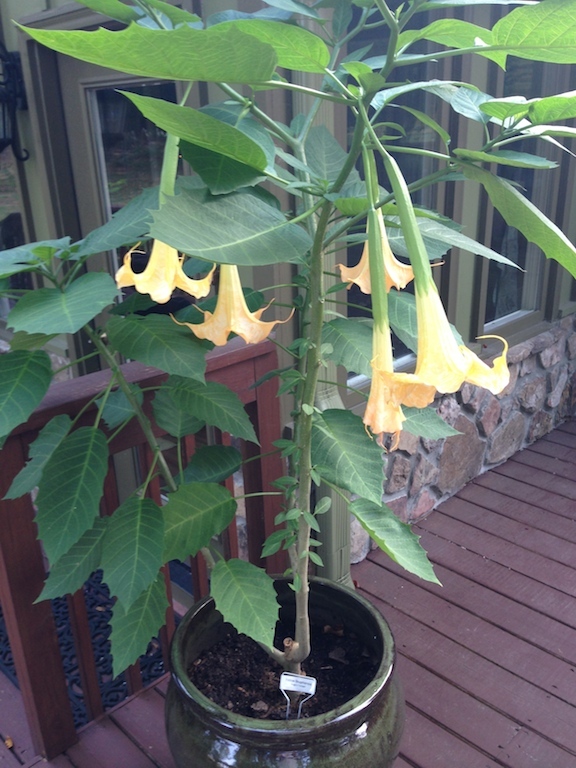 Laura is right the Angel Trumpet is awesome in your garden! I had a ruffled purple and white flowering one in Florida. 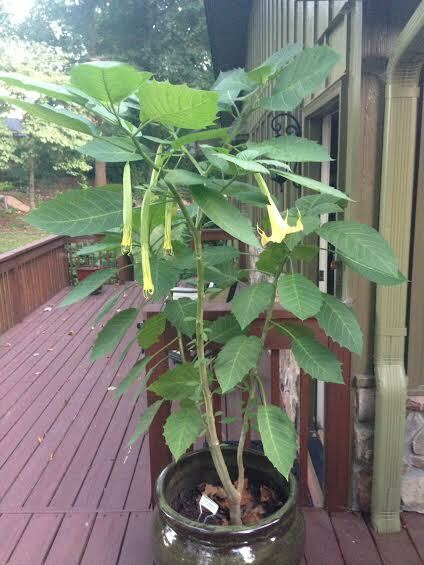 When I moved here to NC I saw a neighbor had an Angel Trumpet up against the house and it survives winter! I plan to grow a few next year close to the house for protection from the cold. They are VERY easy to grow from seed. The pot you have her in is too small if you don’t want to be watering so much. A bit more room would give you a fuller looking tree. If you put a layer of mulch it would help retain water. If you really want her to bloom add a tablespoon of osmocote and you will see an explosion of flowers! :) Not sure if I spelled osmacote right but I know that’s close. That pot is huge so good to know it’s too small! 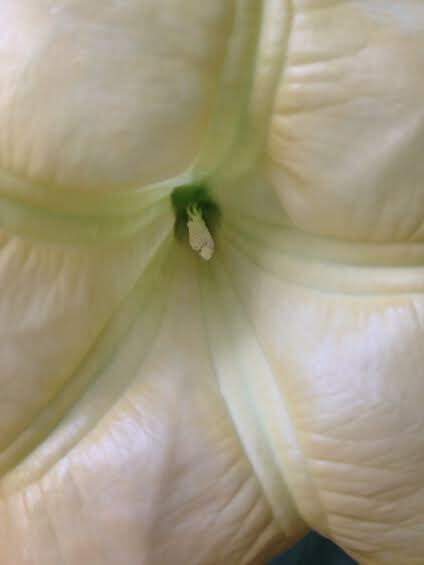 Now I’m concerned about it surviving winter in the pot. I’m ready to cut it back and cover it with mulch to see if it will. If it survives winter, I’ll try putting it in the ground next Spring. Thanks for all your help!